Whitco supply great products from the world's best brands - so how do you choose? Use our unrivalled product knowledge, professional expertise and unbiased advice to make the best decisions for you. As a respected but proudly independent preferred partner, we are uniquely placed to help customers to cost-effectively purchase the best possible branded kitchen catering equipment including the very latest innovative designs. 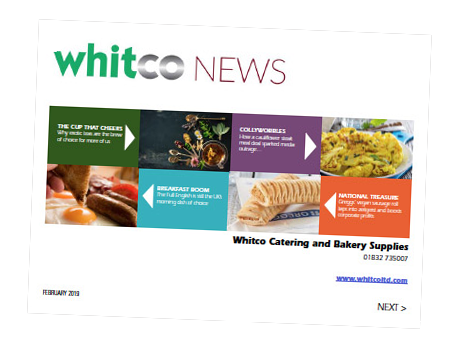 Whitco can also help customers to maximise the commercial benefits delivered by any investment by calling upon unrivalled product knowledge to deliver friendly, professional training programmes on-site or in our own unique test kitchen. Where required, additional training can be arranged through our manufacturing partners. Based in Lowestoft, Suffolk, Applied Design and Engineering (Adande) was founded by Ian Wood and George Young as an HVAC engineering consultancy specialising in industrial ventilation, refrigeration and air conditioning for the offshore oil, gas and petrochemical industries. The Adande Refrigerated Drawer system was the brainchild of the two consulting design engineers who were frequently asked by chefs working on North Sea oil and gas rigs to provide fridges and freezers that would hold temperature. With staff on the rigs being fed day and night, the fridge and freezer doors were in constant use, which was leading to food spoiling and being thrown out. Established more than 90 years ago, Angelo Po, is a market leader in the design and production of complete systems for the catering industry worldwide. From horizontal and vertical cooking lines to food storage systems, the company delivers solutions of superior quality that anticipate the most innovative trends to help chefs achieve outstanding performances. Angelo Po belongs to Marmon Food, Beverage & Water Technologies, a company of the US holding Berkshire Hathaway Inc, and it operates on a worldwide scale through offices abroad and a widespread sales network. The home of Charvet is located at the foot of the Chartreuse mountains, where its tradition of manufacturing premier kitchen equipment dates back almost a century. The people at Charvet proudly live up to the values of quality, excellence and precision with a culture of innovation and service to satisfy the pressing and changing demands of chefs, businesses and corporations. Charvet Premier Ranges is the sole importer of Charvet equipment to the UK. The Charvet UK team work with Whitco and support the entire process from specification, quotation and design through to training, hand-over, technical back-up and spares. Founded in 1983, Counterline is a market leader in the design and manufacture of high quality bespoke foodservice counters and displays. The Counterline portfolio of customers, includes many of the leading High Street retail outlets and prestigious corporate head offices world-wide. Drawing upon 30 years of experience as the industry leader, Counterline remains completely focused on maintaining this position through quality, innovation, dedication, service and value. Counterline's ranges of products has been designed to meet and satisfy the needs of our customers and varying food trends on every level. The Danbake oven has been a familiar sight in commercial kitchens all over the world since 1986. That is mainly due to its robust build, the use of high-quality materials, clean design and a reputation for great reliability. Over the years, Danbake has extended its production to inclide other essentials of the commercial bakery including spiral dough mixers, proving cabinets and automatic climators, all manufactured of course, to the same high-quality standard of workmanship as the Danbake oven. Dualit have been providing British-built safe, high quality products that make life in both professional and domestic kitchens, much easier since 1945. The distinctive look of Dualit's products has remained iconic over that time, even though the designs have evolved, they remain timeless. To mark its seventith annivarsary Dualit ran a competitionto find the oldest of its appliances still working. the winner was a toaster built in 1973 which had passed through generations of the same family, in service in both commercial and dmestic applications - and still going strong after 43 years of daily use. E&R Moffat is one of the most respected brand names in the catering industry, with an enviable reputation for quality and innovation built over 50 years. The company, which is based in a 100,000 square feet factory at Bonnybridge in Scotland, is steadily expanding and maintains sound profitability, while ensuring competitive pricing. The Moffat workforce is highly valued and a policy of multi-skilling allows for manufacturing flexibility and provides a constant source of fresh energy, ideas and improvements. Falcon Foodservice is the UK's leading manufacturer of professional cooking equipment; supplying operators and chefs across Europe, the Middle East and Asia. With a company history going back nearly 200 years, Falcon supply all market sectors, including chain restaurants, breweries, hotels, hospitals, schools, prisons, the armed forces and marine installations. A comprehensive product portfolio, is made up of brands such as Chieftain, Dominator Plus, Falcon 350, Pro-Lite and the F900 Series,s complemented by responsive technical support. Foster Refrigerator, the UK market leader, manufactures a wide range of award-winning commercial fridges and commercial freezers for the foodservice, bakery and retail industries. The innovative product range includes refrigerated storage cabinets and counters, freezer storage cabinets and counters, blast chillers and blast freezers, food preparation refrigeration, multideck refrigerated display, patisserie display fridges, multideck display chillers, ice makers, water coolers, walk-in coldrooms, temperature monitoring and equipment for the professional baker. Gamko are global leaders in the manufacture of professional drinks coolers for the bar, leisure and catering industries. Gamko products have delivered a unique blend of inventive spirit and precision engineering to customers across the world since 1958, hlping to revolutionise the professional drinks cooling industry. Gamko design, manufacture and supply an impressive range of drinks cooling equipment tailored to meet the changing needs of the bar, leisure and catering industries. Refrigerators and freezers from Gram fulfil the varied needs of all parts of the foodservice industry. From Michelin stared restaurants, Five-star hotels, hospitals, schools and staff canteens Gram provide products and solutions for customers of all sizes. Some of Gram's products are specifically designed for self-service facilities in restaurants, hotels and canteens. Gram refrigerators and freezers feature an air distribution system that ensures the cabinets are holding the correct and uniform temperature from top to bottom. That way you get the best out of your food. Greyland is one of the UK's leading cleaning chemical products manufacturers. The company offers a comprehensive range specifically for toilets and washrooms, hard surfaces, flooring, the catering industry, hand care and specialist cleaning needs. Greyland's commitment to quality is backed up by an ISO9001 accreditation and a reputation for fast delivery, keen prices and a dedication to hgh levels of customer service. Hobart UK is a market leader in commercial catering equipment, manufacturing cooking equipment - under the Bonnet brand - warewashers and food preparation machines for the foodservice industry. Hobart provides cost effective solutions fully supported by service and parts throughout the UK. Hobart’s parent company, ITW, is a glovbally diversified manufacturer of advanced industrial technology. Hubbard Systems is the UK’s leading specialist distributor of ice making equipment and has been associated with Scotsman for nearly 50 years. Hubbard is known for its expertise and for the professionalism of its pre- and after-sales support. In the 2013 customer satisfaction survey, Scotsman came top in the quality ice machine equipment category and Hubbard Systems scored over 90% in all question categories, including ease of contact, enquiry handling, delivery, accuracy and technical support. IMC offer a range of commercial food preparation solutions. These include commercial underbar and refrigeration equipment, designed to meet the needs of restaurants, bars and cafes. IMC also provide a wide range of multi-award-winning waste management equipment to provide the perfect solution for dealing with all your dry food waste problems. IMC's high-speed vegetable peelers and chippers from table top to stand alone models that are among the fastest on the market. Since 2005, Jestic has been an integral part of the foodservice industry, working closely with clients, chefs and brands around the world to become renowned for providing catering equipment that does more than just cook. With a team that's steadily grown , Jestic's passion for equipment excellence has flourished. The Jestic marque know encompasses a range of brands, including Wood Stone, Josper, Servequip Distribution, Henny Penny, Ayr King, Ugolini, Vitamix, Zumex, Hugall Services, Sveba Dahlen and Glimek. Liebherr is a multi-national with a wide range of interests across many industries. Its offering of products for the food and drink industry is extensive and includes fridges, freezers, wine chillers, and bakery equipment. Its range of specialist appliances is completed by retail display for chilled and frozen food, appliances fir the drinks industry, freezers for the ice cream trade and even fridges and freezers designed to meet the exacting demands of research laboratories. Lincat is a leading name in commercial catering equipment. With a range extending to some 450 products, Lincat can meet the majority of catering equipment needs. Its products include oven ranges, hobs, combi steamers, fryers, griddles and grills, as well as hot cupboards, water boilers, food display merchandisers, vegetable prepration equipment and ventilation canopies. Lincat is part of The Middleby Corporation which is the parent company of many well-known food service brands. Built on a wealth of experience, Mainca have supplied quality commercial equipment to the butchery, bakery and catering trades for more than 40 years. Mainca continually review and improve the range of its commercial equipment and have helped develop machinery which is particulary adapted for conditions in the UK market, in which the company has operated for more than 25 years. Mainca's commitment to innovation and design is very apparent throughout its range of commercial equipment. Manitowoc Foodservice is the name behind 23 global food service brands worldwide, with roughly half of them positioned as brand leaders. These include Frymaster, above, Manitowoc ice machines, Convotherm combi steam ovens, Merrychef high speed ovens, its own brand of beverage systems and Garland counter top ranges, griddles and broilers. Its broad product portfolio is designed to provide a full kitchen of solutions to improve productivity, quality and profitability for its customers. Meiko are specialists in warewashing, cleaning and disinfection technology, and its products have won worldwide acclaim. Its products are designed to cater for all sizes of applcation and range from efficient under-counter machines to fully automatic standalone units and all-in-one systems. Meiko products fulfil diverse requirements in numerous different settings, including hotels and restaurants, canteens and catering firms, butchers and bakers, and the hospital and care sector. The Rational Group is a world market and technology leader for the thermal preparation of food in professional kitchens. The company was established in 1973 and now employs more than 1,700 people, with over 850 based in Germany. Rational is based in Bavaria near Munich and has operated in the UK for the last 25 years. The company offers a range of high speed finishing appliances, overnight cookers, bakery units, sous-vide cookers and smokers, among others. More than 40 years in the making, the Robot Coupe range encompasses a range of powerful commercial processors for all kinds of food preparation including high-speed slicing, dicing, chopping, pureeing, juicing, grinding, mixing, and grating. These French-built machines, from the heart of Burgundy have stood the test of time. The company offers a wide range of machines adapted to all professional needs including restaurants, institutions, delicatessens, caterers and others. Swiss-made Valentine fryers, pasta cookers and noodle cookers are used widely throughout Europe in some of the most prestigious kitchens, galleys and serveries. Available in the UK since 1956, Valentine is a well-established brand with a reputation for reliability. The company's appliances are used in a variety of formats: freestanding, built-in or table-top. They are adept at cooking a wide variety of foods that require deep frying, steaming, boiling, keeping hot and sous-vide regeneration. Established in 1993, Valera supply a comprehensive range of commercial cooking equipment, commercial refrigeration, glasswashers, dishwashers and counter solutions to a range of sectors and budget requirements within the food service industry. Aside from their own brand products, they also represent brands such as Panasonic, Jordao Cooling Systems, Fagor, Quik n' Crispy, Masterfrost, Osborne, Autonumis, Silfer, Vestfrost, Elcold, and Scaiola. With 70 years of manufacturing experience, Victor delivers an extensive range of catering equipment for hotels, restaurants, hospitals, sporting arenas and educational establishments. For over 30 years Williams Refrigeration has built a worldwide reputation for quality, performance, innovation and reliability in professional catering refrigeration. Williams’ award-winning refrigeration solutions meet global commercial requirements and exceed international ISO 9001-2008 quality standards. A comprehensive range of commercial refrigerators includes high performance cabinets, counters, reach-in / modular blast-chillers and freezers, coldrooms, back bar and specialist bakery equipment. Winterhalter opened its UK office in 1971 and is the only company that solely concentrates on warewashing; machines, water treatment, chemicals, racks and service. The company works with many of the country’s leading pub, restaurant, hotel, supermarket, coffee shop and casual dining groups. In addition we’re proud to supply a large proportion of the Michelin-starred restaurants and chefs around the UK. Winterhalter also provide warewashing solutions to the public sector where its larger schemes can often be found in hospitals, universities and prisons. In 2016 Zanussi celebrated a historic landmark by achieving its 100th anniversary in business. The company has come a long long way since its first-ever product, a wood-burning stove. Today's appliances incorporate state of the art design and leading edge technology. Its current range provides solutions for all modern commercial needs and includes induction hobs, combination ovens, static preparation areas, pizza ovens, refrigerators, dishwashers, panwashers, ventilation systems, mixers, cutters, slicers, peelers and emulsifiers.